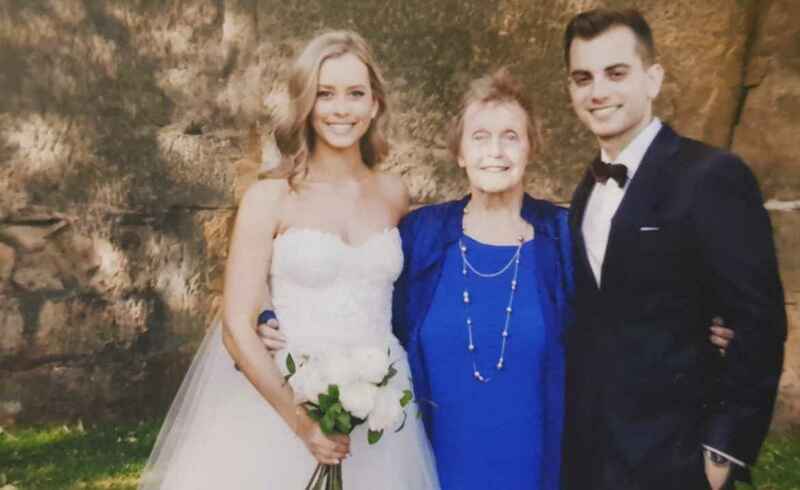 Ashburn House resident Joan couldn’t have been prouder when her granddaughter’s Mosman wedding featured in the number one read bride magazine in Australia. A proud grandmother, Joan has two lovely granddaughters Annie and Millie. A highlight of Joan’s life was being able to attend the recent wedding of her granddaughter Annie on the water at Mosman. To top it all off, the wedding featuring in a current print of the glossy “Cosmopolitan Bride” magazine. Joan Beaumont was born in April 1933 in the village of Holywell, Northern Wales in the United Kingdom. She was the youngest of five children with older siblings being Elsie, Sylvia, Robert and Betty. A ten year age gap between Betty and Joan meant that Joan was often on her own as a child growing up. Her father had been a professional soccer player in England before the First World War and sadly died with recurring complications from war injuries when Joan was five years old. Joan and her mother eventually moved to the village of Saltney in Northern Wales and even though the nearest school was in Chester City, England and only one mile away, Joan had to attend grammar school 15 miles away in Wales as the country was trying to revive the Welsh language therefore encouraging more to be schooled there. Leaving school at 15 years of age, Joan secured a job as a junior clerk with an automotive business then later with a large dental practice in England. Joan was able to take the bus from Saltney in Wales across to Chester City in England daily to work. When Joan was 17, a friend invited her to a dance at the nearby army camp and there was introduced to her future husband Terry Chapman who was in the army completing his deferred National Service. Terry had requested to complete his journalism course prior to entering the army. That night, Terry asked Joan’s permission to accompany her home from the dance and from then on were courting until marrying when Joan was 19 years of age and Terry aged 22. Joan (right) at Ashburn House in Gladesville. 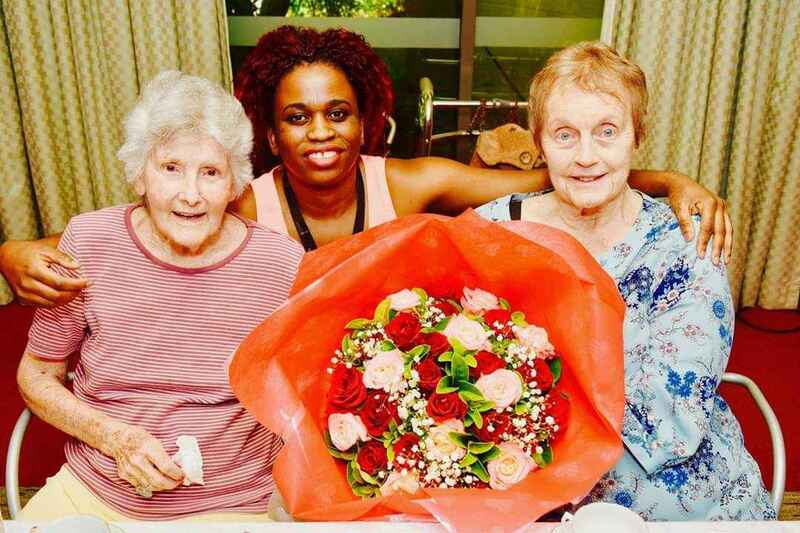 Living in London with her mother-in-law while Terry continued with his National Service in Japan, Joan and Terry were very grateful to his army captain who kindly loaned them funds for the fare for Joan to live in Kure, Japan. After a year, Terry was posted to Hong Kong where he and Joan resided until Terry was demobbed from the army. The couple chose to reside in Australia where Terry took up his journalistic career working for the Rupert Murdoch industry. Living and renting in Balmain, the couple managed to save a decent deposit on a home in The Avenue in East Balmain with lovely water views, but in those days the 24 hour noise from the nearby Colgate and Unilever factories was quite frustrating along with the active daily grind emitting from the dry docks with work continuously underway on boats. Eventually the Chapmans were fortunate to buy the block next door and managed to extend their home. Joan recalls their Balmain-born sons, Matthew and Daniel as children enjoying the freedom of playing cricket in the street with their mates and exploring their surrounds. After many years of marriage, Joan was unprepared and devastated by her husband’s decision to leave. The family home needed to be sold in settlement of the divorce enabling Joan to buy again in Balmain, where one of her sons continues to reside today. Joan eventually connected with a long time male friend only to end this relationship after nine years when she realised that she needed to be free, and never regretted not remarrying. Joan had kept her social life active in Balmain and surrounds and continues to receive regular visits to Ashburn House from her old book club friends and others who drop in regularly to visit and go to Bronte Café to catch up. Joan is also involved in many activities of her choosing within Ashburn House.